Napoletano Mr. Mauro Boarded in Genoa. Passed away in January 1994. Napoli Mr. & Mrs. Mrs. Napoli was asleep in a cabin with three other women. Mr. Napoli came to the cabin to warn them. Daughter Angelina 4 yrs Boarded in Naples. On their way to Rochester, NY Rosa was treated at Roosevelt Hospital for bruises. Rescued by the Ile de France. 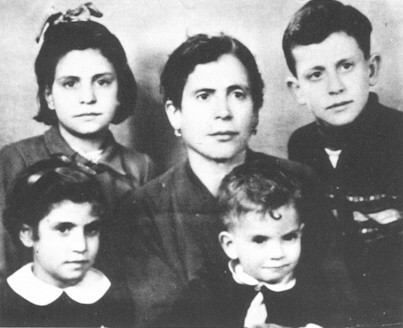 Napolitano Ms. Assunta Accompanied her nieces Lucia, Francesca and Grazia Pacchianno. She was separated from her nieces during the rescue. Nesci Mr. Antonio 30 yrs Boarded in Naples. Passed away 1997. Daughter Maria 4yrs From Bonza, Naples. 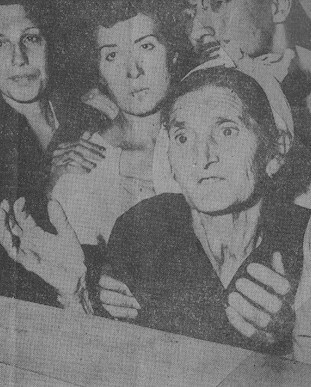 Carmen and Maria were rescued by the Ile de France. (Noceroa) Mr. Rosario Boarded in Naples. Nogatino Mr. Virgilio Rescued by the Cape Ann with cuts and bruises of the hands ands and eye. Notaro Mr. Francesco 47 yrs. Son Rafaelle 18 yrs. Boarded in Genoa. Rescued by the Ile de France. Francesco is deceased and Rafaelle lives in California. Mrs. Maria 27 yrs Boarded in Naples. This was their last stretch of their honeymoon before immigrating to Canada. Both were rescued by the Stockholm. Tomasso is living in Canada. Maria passed away in 1993. Odehnal Dr. Eva 26 yrs Boarded in Genoa. From Vienna. Fullbright Scholar on her way to Northwestern University. With the family separated during the confusion, Grazia, Lucia and Francesca were brought to the Ile de France. Their mother was on the Stockholm. Felice, Antonio and Giuseppina were on the Thomas. Antonio is living in the US. Pagella Mrs. Giustina 55 yrs Boarded in Naples. From Connecticut, returning home after visiting relatives. Rescued by the Ile de France. Passed away in 1971. Antoinette 18 mos Sold his house in Bari, Italy to emigrate to the United States and lost his money, documents, clothes and jewels. He restarted his life with nothing. Maria was separated from her parents during the rescue and was reunited with them 24 hours later, after her a police detective directed them to a little girl asleep in a city shelter. Rescued by the Ile de France except for Maria, rescued by the Cape Ann. Ms. Francesca Maria Boarded in Naples. Perished in the collision. Son Luigi 7 yrs Boarded in Naples. Residents of Buffalo, NY Rescued by the Stockholm. Luigi lives in the US. Mrs. Angelina Boarded in Naples. Antonio was treated at Roosevelt Hospital for critical coronary condition. 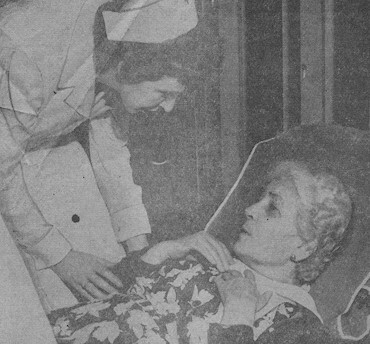 Angelina was treated at Roosevelt Hospital. Paul Mr. Sergio Boarded in Naples. Pepe Mr. Matteo Boarded in Naples. Perrone Mr. Pietro Boarded in Naples. Mrs. Maria Antonietta 65 yrs Boarded in Naples. From a small town near Rome. Rescued by the Ile de France. Maria was traveling with her son, Salvatore Villani, and his family. They were separated and for three days she did not know the fate of her family. 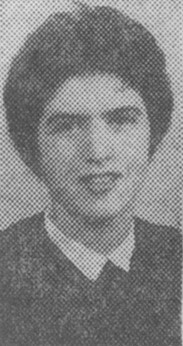 Maria passed away in 1976. 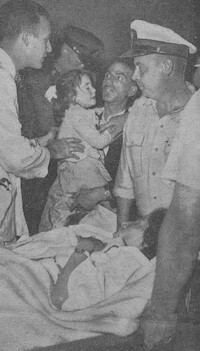 Daughter Maria Boarded in Naples. Son-Michael 8 yrs Boarded in Naples. Rescued by the Cape Ann. 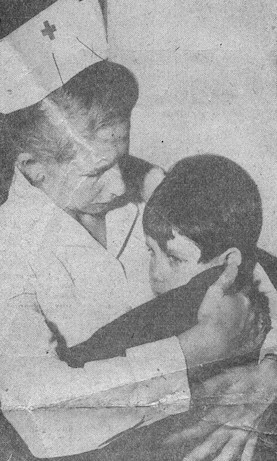 Vincenzo was treated at Bellevue Hospital. (Picone) Ms. Filomena 19 yrs Boarded in Naples. Heading for Greece, NY. Brother Antonio 14yrs Boarded in Naples. 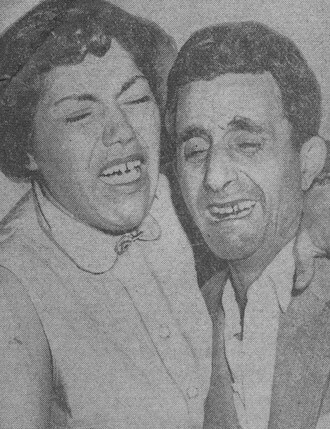 On their way to join their mother in Newark, NJ, Antonio was trapped in C-Deck cabin 664, in the section where the collision occurred. 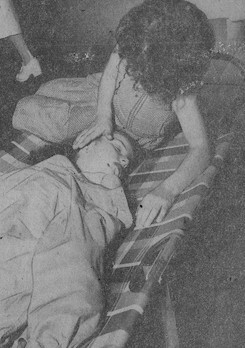 His cabin mate, Antonio Lombardi, broke down the cabin door and dragged him from his bunk. Antonio was rescued by the Stockholm, Marcella by the Cape Ann. Daughter Bruna 1 yr Boarded in Naples. Rescued by the Stockholm. All are living in the U.S.
Puccio Miss Maria Boarded in Naples. On her way to Buffalo. She was asleep in the cabin with three other women. Rescued by the Ile de France. Sister Mrs. Carmela 24 yrs Boarded in Naples. Rescued by the Cape Ann. Both are living in the US. Son Roberto 5 yrs Boarded In Naples. Giuseppe was rescued by the Cape Ann, the rest of the family by the Ile de France. Photo: Roberto strokes his fathers face. Rado Mr. Vincenzo Boarded in Naples. Regina Mr. Antonio 17yrs From Bari. Boarded in Naples. Found 4 yr old Maria Paladino alone on a lifeboat. Unable to locate her parents he kept Maria with him. Rescued by the Cape Ann. Ricchezza Mr. Andrea Boarded in Naples. Rescued by the Ile de France. Deceased. Daughter Maria 4yrs Boarded in Naples. From Ponza, Italy. Came to visit relatives on E 149th St. Son Vito 4 yrs Boarded in Naples. Mr. & Mrs. Rizzi were injured in the collision and were rescued by the Ile de France and treated at Roosevelt Hospital. Their 2 children were placed in a lifeboat and rescued by the Cape Ann. Ms. Rosina Boarded in Naples. From Marsala Sicily. Rodriguez Rev. 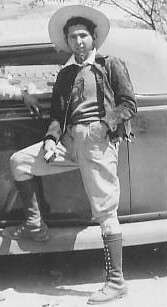 Armando Boarded in Gibraltar. Romano Mr. Giacomo 20 yrs Boarded in Naples. Rescued by the Stockholm. Living in Italy. Photo: Ugo Rubino is greeted by a relative. Daughter Carmina 20 yrs Boarded in Naples. Rescued by the Ile de France. Daughter Vincenza 8 yrs Boarded in Naples. Coming to the US to start a new life, they were on C-Deck in the direct line of the collision. They perished. Russo Mr. Francesco Boarded in Naples. Russo Mr. Bruno Boarded in Naples. Rutigliano Mr. Michele Boarded in Naples. Frank was rescued by the Ile de France. (Saianto) Ms. Theresa 48yrs Boarded in Naples. From Hillsville, PA. Treated at St. Vincent's Hospital for bruises of the right wrist and left knee. Schmidt Mr. Gustav Boarded in Genoa. Fulbright student from Austria. Rescued by the Stockholm. Schneider Mr. Heinrich J. Boarded in Genoa. Austrian scholar, photographed passengers waiting for lifeboats. Schoenbaum Ms. Louise (Theresa 71 yrs) Boarded in Genoa. From Cincinnati St, Los Angeles CA. Treated at St. Clare's Hospital for a fractured pelvis. Schoer Ms. Lee 26 yrs Boarded in Genoa. Secretary from New York. 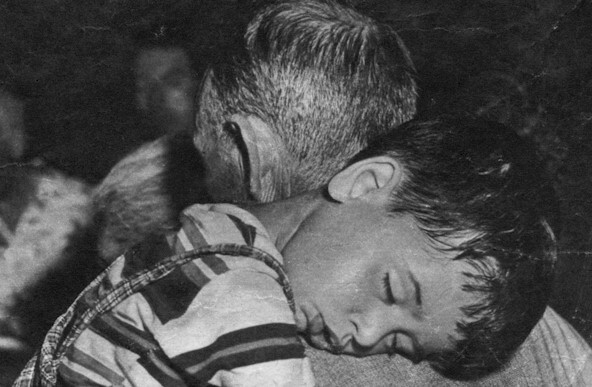 Son Antonio 3 yrs Oggi Photo: Antonio sleeping on his father's shoulder. Son-Rocco 4yrs Boarded in Naples. 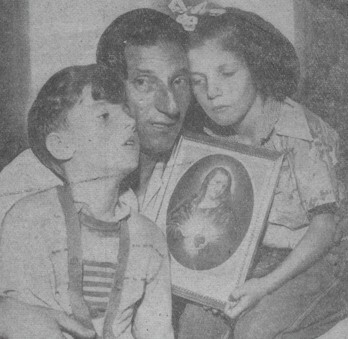 Maria and her children were coming to the US to join her husband, Ross, in Indiana. Cabin 656 on C-Deck was in the direct line of the collision. They all drowned quickly as water poured into C Deck. 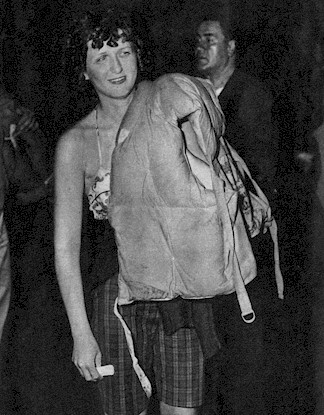 Mrs. Margaret Boarded in Naples. Unable to search for Paul's sister-in-law, Maria and her children, they left C-Deck for the lifeboats. Rescued by the Ile de France. Paul passed away in 1972, Margaret in 1978. (Sfagaro) Ms. Julia Boarded in Naples. Sibiana Ms. Giovanna Boarded in Naples. Sigona Mr. Corrado Boarded in Naples. Lives in the US. Ms. Omerina 21 yrs Boarded in Naples. Heading for Rochester. Simioli Mr. Luigi Boarded in Naples. Passed away in 1993. Simon Reverend Benedict Boarded in Genoa. From Washington D.C. Was watching a film on Foyer Deck and was thrown to the floor by the collision. Treated at St. Vincent's Hospital. Soligo Mrs. Anna Missana Boarded in Genoa. Ms. Alicia 20 yrs Boarded in Cannes. Rescued by the Stockholm. Living in the US. Suozzi Mrs. Michelina Gabbamonti 49 yrs Boarded in Naples. En-route to Philadelphia, PA Her C-Deck cabin was in the collision site, she perished. Daughter-Gina 2yr Boarded in Naples. Maria and Gina rescued by the Stockholm. Rocco was rescued by the Ile de France. Theis Ms. Marcella Boarded in Naples. Torre Mrs. Angela 60 yrs Boarded in Genoa. Traveling with her daughter, Ellen Dean. Rescued by the Ile de France. Treated at St. Clare's Hospital for possible fracture of the right leg. Passed away in 1980. Ms. Agatina 52 (56) yrs Boarded in Naples. From Lawerence, MA. Treated at St. Vincent's Hospital. No Diagnosis. Tosi Ms. Patricia Boarded in Cannes. Living in the US. Vali Mr. Giovanni 27 yrs Boarded in Naples. Jumped into the ocean to save Melania Ansuini when she lost her grip on a rope and fell into the water unconscious. He saved her life and they were married eight months later. Varone Mr. Salvatore Boarded in Naples. Daughter Pina 8yrs Boarded in Naples. Andrea, Concetta & Pina were rescued by the Ile de France. 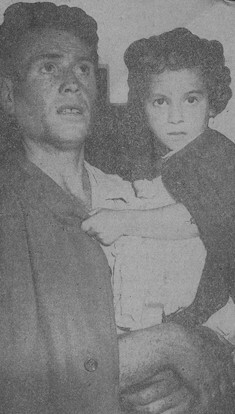 Pasquale was rescued by the Stockholm. Andrea passed away in 1979. Concetta and Pina live in the US. Pasquale lives in Italy. Mr. Marcial Pardo Boarded in Gibraltar. From Mexico. Passed away in 2001. 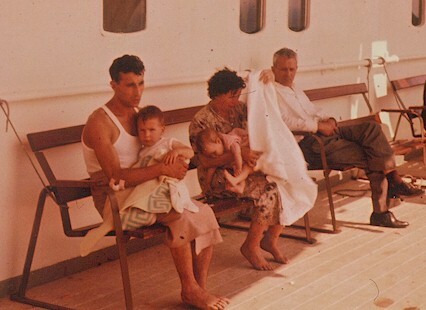 Daughter Marina 3 yrs Boarded in Genoa, from San Marino. Living in the US. Maria was 6 months pregnant. Rescued by the Ile de France. Son Domenico 5 yrs Boarded in Naples. Rescued by the Stockholm. 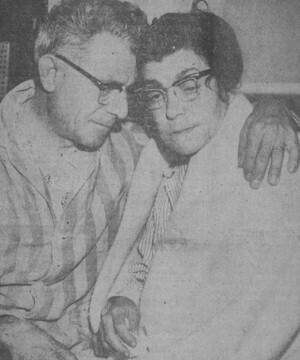 The family was traveling with Salvatore's mother Maria Perotta. Maria became separated from the rest of them. They found her three days later in a New York Hotel. Mrs. Carmela 61 yrs Boarded in Naples. From Portsmouth, NH. Carmela treated at St. Clare's Hospital for a spine injury. Waite Mr. Raymond Anthony 24 yrs Boarded in Naples. A seminarian from Philadelphia that tried to assist in freeing Mrs. Peterson from her cabin. Like scores of other passengers took off his shoes to get a better grip on the sloping deck. Daughter-Rose Marie 3yrs Boarded in Genoa. From Birmingham AL. Mrs. Wells shared an A-Deck cabin with her three children. 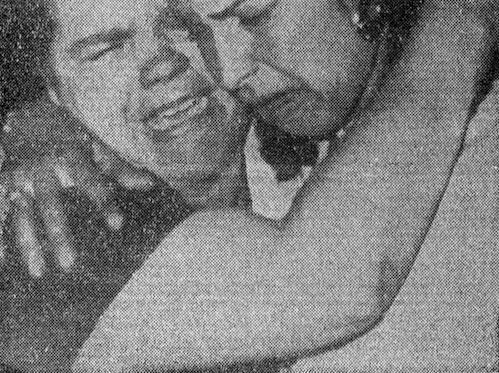 Although her cabin door was open she couldn't leave, for her youngest child, three and a half year old Rose Marie, was trapped by an arm caught between her bunk and a bulkhead. 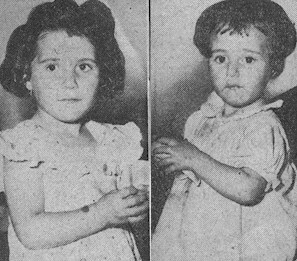 Alba, Shirley and Rose Marie were rescued by the Ile de France. Henry was rescued by the Stockholm. 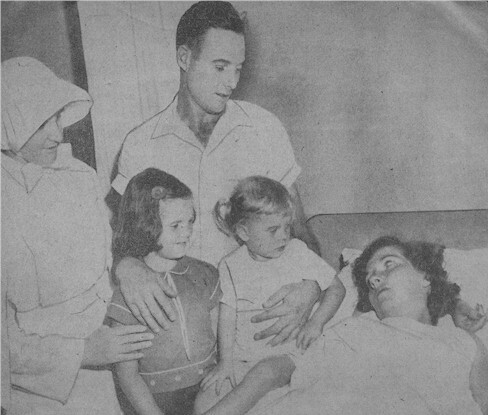 Alba and Rose Marie were treated at St. Vincent's Hospital. AP Photo: Charles Wells visits his wife and daughters at St. Vincent's Hospital. 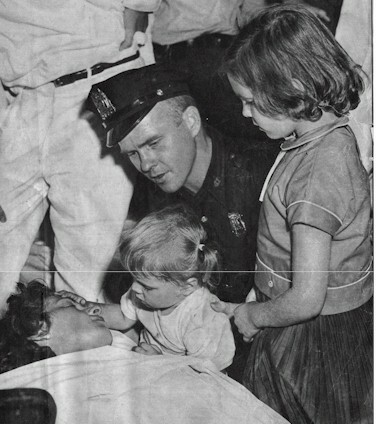 Oggi Photo: Three year old Rosemary Wells caresses her mother's head while her sister Shirley, 8 years old and Officer Kenneth Anderson, watches. Willimann Mr. Joseph Boarded in Genoa. From Zurich, Switzerland. Rescued by the Stockholm.